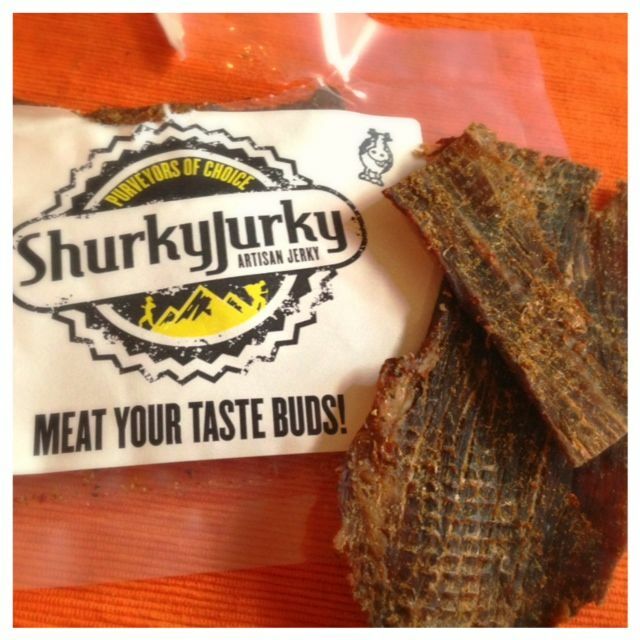 Shurky Jurky: Do you want to try some of our chocolate covered jerky? The only bummer is that they actually ran out of the chocolate covered by the time I responded, but they did send me a few other varieties. Our family really enjoys jerky as a snack, so we are good candidates to try this. We have switched from beef to pork because the pork was more tender. So trying Shurky Jurky’s beef was going to be a true test. We were told we would get a variety pack. I guess I was so excited when I opened the package I forgot about that. I started chowing down. It wasn’t until the second piece that I noticed another flavor. Aside from having Beef, Pork, Bison and Turkey, here is what they offer. Traditional Smoked – just our best rip tear jerky. Ready, willing, able and completely naked. Really! No frills, just, good ol’, quality meats. Peppered – for those who like it black, we topped it with coarse black pepper. Not too spicy, not too hot, just peppered, kind of like goldilocks, just right. Or is it so right and yet so wrong. Spicy – we kicked it up a few notches for those who like some real heat. The red chile pepper flakes adorning our jerky are sure to make you sweat, even if just for a short while. Burn baby, burn. Guajillo Chile – this sublime Mexican chile pepper is mild, sweet and tangy with a back-loaded spice profile that’s very forgiving. It’s our favorite. Sesame – Asian sesame seeds take you on a journey to the old orient with a flavor trip that makes a memorable impact. Bon voyage. The peppered and Guajillo Chili(which we had) all had some kick to them but not too much you couldn’t enjoy it. The true test came from if we could actually rip into it without killing our teeth. They sent us 2 kinds. One was rip tear and the other was soft chew. They were actually very tender, even though they were beef. WIN! It doesn’t stop there. Their product is also gluten free and 100% Paleo, Certified Raw and Whole30 compliant. You might be wondering how you can get your hands on this product. Well…… I am glad you asked. Head on over to their Crowdfunding project and you purchase some and help get this NW business started. You can also try the Chocolate covered Jerky and report back to me on how it is. Disclosure:: We were given free samples. We devoured them and enjoyed them and wished for more, and you would have too. Nonetheless that’s all we had and I give you my true opinion of what we thought of this product.